This whisky has a special place in our hearts. After all, we have walked through its peat bogs. We have drunk from its brook. We have fondled its malted barley. We have tapped its casks. Not all of them, of course. Much to our regret. Actually, this whisky is more special than that. We first tasted this particular whisky on the Laphroaig peat bog. In the light rain of that afternoon, after each of us had tried his hand at cutting peat, we enjoyed a nice little dram of this whisky right on that spot. And in that setting, it was spectacular. But will that assessment hold up around Bill’s kitchen table, thousands of miles from that beloved turf of Islay? In a word: yes. On the nose, there’s rich vanilla, burnt sugar, slowly getting darker and deeper by the moment, bespeckled with an air of mystery. There are also aromas reminiscent of a barrel designed in Guyana to age some experimental rum. Based on the nose alone, I believe that I could soak a poisonous mushroom in this—and then eat it. And be totally fine. The mouth is amazingly smoky. The smoke on the mouth has a nearly tactile character that is difficult to distinguish from the overall mouthfeel, which is chewy and sticky like a treacle-topped bun. When I consider a second time distinguishing the flavors from the mouthfeel, the little man in my head smacks the inside of my skull and yells at me to stop over-thinking it and just enjoy it. And I do what that man says. Add water and it looks like you’re cleaning a frying pan. With water, though, the nose changes to a boiled rasher of bacon placed atop an arugula salad dressed with aged agave nectar and truffle-infused balsamic vinegar. Yes, I’m having the salad last, like a European. But that doesn’t mean I’m done with this whisky. Not by a long shot. Damn, what a dram. 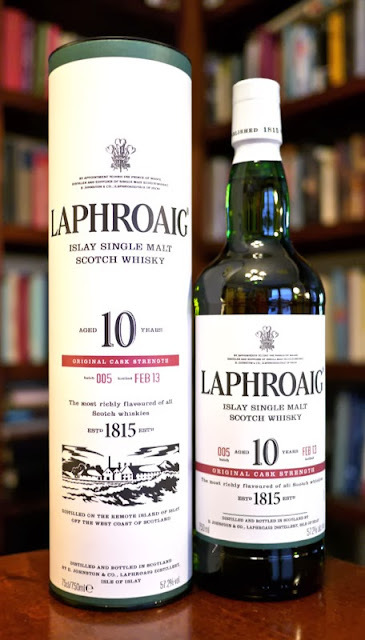 The Laphroaig 10 Cask Strength Batch 005 is The Laphroaig 10 Cask Strength (for me), The Laphroaig 18 (for Bill), and The Laphroaig Triple Wood (John)–Essentially, this rating is a reminder that, at least to some degree, whisky preferences are just that–preferences. Oh, and that context affects whisky preferences, too. Each of us has his reasons for really grooving on the parts of the tour that included the particular whisky that he preferred. I could recount Bill’s and John’s reasons here, but really, would that change anything for you? It doesn’t for me. Perhaps because this whisky is amazeballs. –Our thanks to Simon Brooking and Laphroaig for the sample!